I'm very happy to be a part of a fun class coming up at Big Picture Classes. The class is hosted by Lisa Day and is called 28 Days of Sketches: Round 2. With this class you'll receive 28 brand new sketches and 56 exclusive projects from Lisa and the seven guests contributing to the class. Sketches are a fabulous starting point for your projects, leaving you more time to focus on the fun products, photos and telling your stories. If you've followed my blog long then you know that I am a big fan of sketches. I used the ones for this class for card inspiration. Just because a sketch is intended for scrapbook layout, it doesn't mean that you can't interpret it for a smaller scale card too. 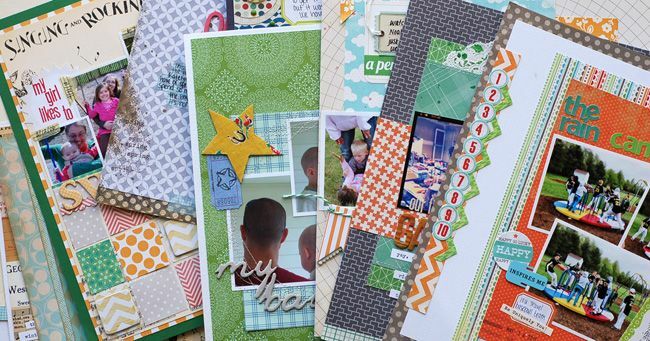 I love thinking outside the box to find some fantastic new layouts for my cards. The class starts on July 19th and ends August 16th. Registration ends on July 25th. The class last 4 weeks. You'll get 28 daily emails, each containing a new sketch, 28 daily handouts, downloadable PDF sketches, a private posting gallery, a message board and 2 live chats with Lisa. I can't wait to see all the completed layouts and sketches, starting on July 19th! Each guest designer, including me, will be giving away a free spot to the class. To enter for my free spot in the class, leave a comment on this post telling me why you like to use sketches for your cards or layouts. Comments will be closed for the drawing on July 16th, 8:00am Central Time. Good luck and hope to see you in class! I love using sketches..it gives me a starting point on my LO's. Would love to win a spot in this class. Thanks for a chance to win. I use sketches often, mostly because I sometime feel lost with taht big, open 12x12. Sketches make it so easy to get layouts done. Sketches are about the only way I can get started...would love to see all the great work by such great artists! Well, I'm in a scrapbooking slump. I have done a few pages lately but before that, it had been a year. I think using some sketches would jump start my creativity again and get me back into creating more consistently!! i haven't really used sketches before but i love to look at them. i think this class would be a good way to really learn how to use them. thanks for the chance. I took rewound 1 and loved it! Sketches are a really great way for me to get a start on a layout. Love them! Thanks for te chance to win! I love sketches, they make it easy to organize my card or page. I think of them like recipes for papercrafting. I can't cook without a recipe and I am much happier with my pages and cards when I use a sketch. Thanks for offering the great prize! p.s. we made your no-bake cookies yesterday...yum and thank you!!! So excited to see all the layouts and the whole picture, too. This looks like a great class :) I love sketches for the reason you posted, great starting point and leaves more room to concentrate on the fun product and photos you want to play with! I love to have a sketch to get me started when I am scrapping! This looks like a fun class. what an AWESOME prize! I'm so excited to have the chance to win !! Sketches are a really great starting point for me because I'm still understanding how to create a flow of the eye, and how to keep from overcrowding my space. I can't wait to see who the lucky winners are! Sketches always give you ideas for your project that you would have not thought of your self. Sketches are a starting point for your projects. I like the different contrast items that sketches have in them. Love to use sketches for layouts, but a good sketch that is used repeatedly in a mini album gives it a sense of unity, too! Sounds like a fabulous class! I've just started dabbling in sketches and love them because they give me a starting point. Some days I can just fumble along and not know what to have as my foundation, or use the same one all the time. Sketches inspire me to go out of my box. I love sketches, and I've taken one of Lisa's classes before, and it was fabulous! I would love to take this class but will be gone for one week during it on holidays, does this matter? The last time I did 28 layouts, it was great to get back to my layouts that were being neglected. Sketches help my pages come together so much quicker! Thanks for the chance to win! This is definitely a class I need as sketches would help get me out of the scrapbooking slump I seem to currently be in. Sketches save time! I get to do the fun part of picking paper and embellies and then plug them in to the sketch! Looks like a fun class! I like to use sketches b/c they tend to jump start my own creative flow. I love using sketches to make cards - or scrapbook layouts because if I have a sketch in mind... then I can start thinking about colors and accessories etc and have the whole thing planned out in my mind before I hit the craft table. So when I do finally have some time to spend there I'm not floundering - I have purpose and can actually accomplish something - LOVE IT! Thanks for the chance to win and for all of the great inspiration and joy you bring us! I love using sketches because it gives my imagination a quick jump start on what I want to do. Thanks for the chance. I have taken several sketch classes and they remain my favorite type of class. I tend to pull out a sketch when I am having trouble geting started. I am always surprised that one sketch can be interpreted in so many different ways. Thanks for a chance to win! I'm really excited about this class, I love using sketches to spark new designs for card layouts. Thanks for the chance to win a spot! I like to use sketches because they give me a starting point and I don't just sit there staring at a blank page wondering where to begin! Loved the first go round. The second looks so good! Thanks for the chance to win! I loved the first Round of 28 sketches! I know Round 2 will be great! Sketches are awesome! They are a great starting point. This would be a great class. Thanks for the chance at a spot! I love to use sketches. So often they provide a jumpstart to the creative process - even if the finished product looks nothing like the sketch. I love sketches! They allow me to have a starting point, rules on some level that I have to follow. Makes me be a creative problem solver. I feel that I am more creative and gets me to try something that I have never done before. Would love a spot in this class! Thanks for the chance! Sketches take the guesswork out of scrapping so I can enjoy playing with the awesome products. Thanks for the chance to win! I love using sketches because it helps you to get a ton done in a small amount of time. Pick a sketch and then products you love and adapt the sketch to your photos! Simple , fast and they turn out so great! I am a huge fan! Winning a spot in this class would be great. Thanks for giving me the chance. I've never used one before, maybe this would be a great time to learn how. I LOVE using sketches for starting layouts...they get the HARD work of doing layouts out of the way and let me get pretty much straight to playing! Thank you so much for the chance to win! I can't wait! Thanks for the chance to win a spot. I love to use sketches. They help me get going on my layout. I tend to over think things and it takes me forever to complete a layout. Sketches give me one less thing to over think! Thanks for the chance to win a spot in this awesome class! I love to use sketches because it speeds up the process. Plus the sketches are always better ideas than what I would come up with. I always use sketches as i need a place for me to start. Since design isnt my strong point, i find sketches help with that and get me on my way . Sketches help me to get started especially for scrapbooking as I sometimes feel lost on the placement and the design of a layout. Sketches help me get it done. With two little kiddos, I don't have enough time to be creative... and just want to document our memories since there are so many of them! I'd love to try out this Big Picture class! I love using sketches because it makes it easier and quicker for me to scrap. I don't have to waste time trying to figure out what goes where or if it looks right! Sketches save me a lot of time. Would love to win this class. Thank you for the chance! I always use a sketch for a jumping off point. They save me valuable time when I find time for a project. Thanks for the chance to win. Would help me learn to follow sketches and accomplish more in less time!! always a good thing!! What an awesome class. I always use sketches! A sketch is like a recipe and all I have to do is go to my "cupboard" and pick out my ingredients. You can use the sketch as it, turn it upside down, reverse it and your results always come out fresh and new. Sketches never go out of style! I would LOVE a chance to win this class! Keeping fingers and toes crossed! I started scrapbooking using BeckyHiggins sketches ... they are my "go to" tool! I use sketches regularly as a starting point. Sometimes, I go off on my own, and rarely looks like the sketch. But I love that it's my "map".. I want to win so that I can learn all that you all have to share! Thanks! Great sneaks. I would love to take this class! I've only used sketches once or twice but I liked it because it inspired me and saved me time and frustration with the blank page. Thanks for the opportunity to win a spot! It sounds like a great class with tons of inspirations. Thank you for a chance to win. Sketches take out the difficult part of scrapping and just leave the fun part, playing with paper and embellishments. Usually my big hang up is the design - if I use a sketch, the hard part is done for me. I can then progress through product selection, journalling, photos, etc. to a finished LO more easily. Thanks for the chance to win! Sketches give me a lot of inspiration and they help me when I have no idea where to start. Thank you for the opportunity to win. I love using sketches as a starting point. I love using sketches because it speeds up the process for me so much, but I can still put my personal touch on the layout. I really want to join this class, hope I get lucky! Thank you for opportunity! Oh my goodness, I love sketches (they really help when I'm in a rut) and thank you for a chance to win a spot! I like to use sketches to save time. It helps me get more done in the time I have to scrap. What a great class! I love sketches, because they give me such a good foundation! Thank you so much for the chance! I like to use sketches because sometimes I get stuck in a rut and need inspiration. I would love a chance to win. Thanks! Sketches help me to get a lot accomplished without having to tax my poor brain too much. I do enjoy coming up with my own ideas or put my own spin on the sketch, but it makes things move along nicely when I'm behind on my pages!!! It would be so wonderful to win a spot in this class, as I love to use sketches for all my layouts. And the addition of 8.5 x 11 size is great...that is what I scrap! I like to use sketches for the same reasons I like to try new recipes - to try something new, to have a tested set of ingredients, to try a new technique, to expand my knowledge of cooking. Sketches and recipes are both great! You do beautiful work. I'd love the inspiration! I would so love to win this class. I am currently making my twins their senior year albums and need all the help and inspiration I can get. Thanks! Sketches give me a rough ideas to gather the products I want to use. It just makes it easier. Thanks for the chance! This looks like a great class! I can never seem to come up with new and creative layout ideas so I depend on the work of others! I love to work with sketches and this class sounds like so much fun. Thanks for the chance to win a spot! I use sketches for almost every layout I do, so this class looks amazing. I am hoping to find ways to use my sketches in way I haven't thought of. I love that you used a sketch to make a card! how clever. Can't wait, thank you. Love sketch classes. Thanks for a chance to win. Sketches help break the creative block I often get. Thanks for a chance to win. I love using sketches because it makes the page design so easy!!! Thanks for the chance to win! I like using sketches because it saves me time. I have a lot of product, but not a lot of creativity. I can look at a sketch, go through my stash and be done it no time! This class looks amazing!!! Thanks so much for the chance!! Sketches get me started and sometimes I really need that. 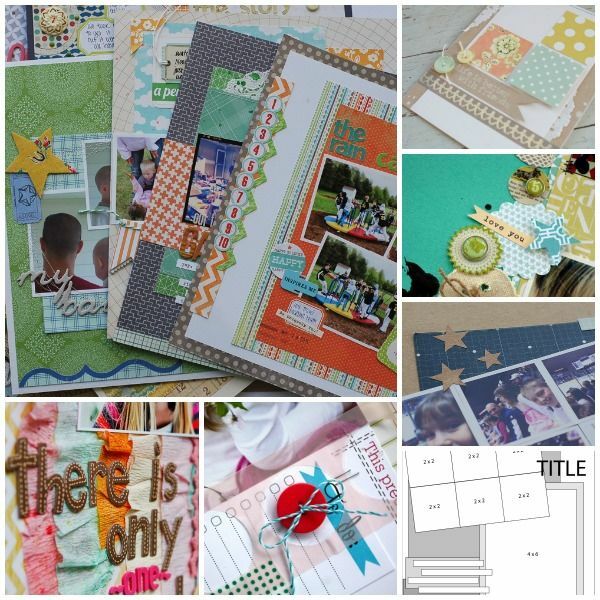 I've been spending so much time on my Project Life layouts that I haven't done many 12x12s lately. Thank you for the chance to win a spot in the class!